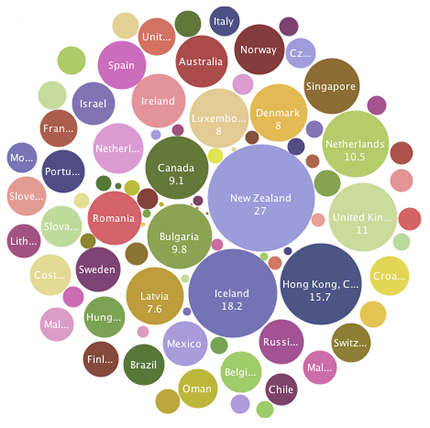 Bubble chart of nations sized according to new business density. Source: 2008 World Bank Group Entrepreneurship Survey. Good data on micro-enterprises and entrepreneurship around the world is hard to come by. There’s the World Bank’s Micro, Small and Medium Enterprises Database, but it has more caveats than a prescription drug commercial. Different governments operating in different economies at different stages of development have different definitions for these things. The 2008 World Bank Group Entrepreneurship Survey comes close, “striving to define a unit of measurement, source of information, and concept of entrepreneurship applicable and available among the diverse countries surveyed.” This limits it to the “formal sector”—small companies registered with their governments—as opposed to the informal sector, like most sellers on Etsy. Still, it’s of some interest. Above, a screenshot of the Many Eyes bubble chart version of some of the data, with nations sized according to “new business density,” or the density of new registered companies per 1,000 citizens. New Zealand, Iceland, Hong Kong, the UK and the Netherlands round out the top five. See the same data on a map here. See also: Etsy and the World Economic Forum.